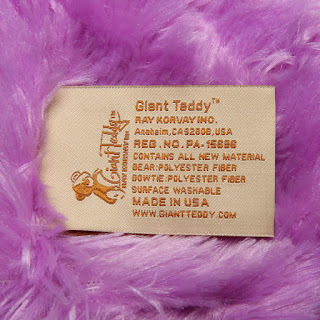 Giant Teddy Brand is Unique...Adorable, Huggable, Super Soft, and GIANT! Giant Teddy... one of life's most huggable experiences! 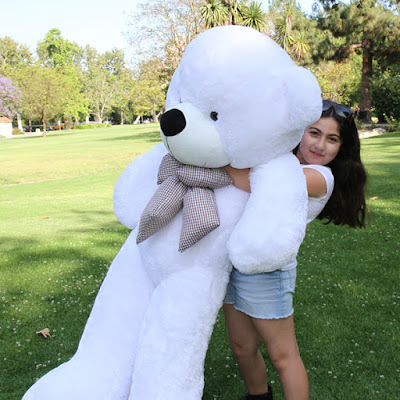 Giant Teddy is located in Anaheim, California, and we make some of the biggest, softest, most huggable teddy bears and stuffed animal friends on earth. We know that shopping online has great benefits (you can shop anytime, from anywhere, even in your pj's) and limitations (you have to imagine how products look and feel) so we wanted to take a minute to show you how we measure and size our teddy bears. 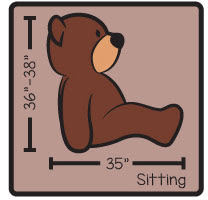 We'll show you how the bear measures in sitting position - some bears are more "sitting" style, and some are more "standing" style, with legs that can bend to sit or be straight down when you hold the bear upright. Cuddles Family are an example of "standing" style, and the Shags Family is an example of a more "sitting" style. 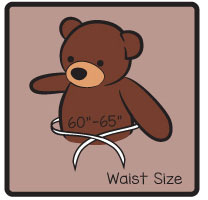 We include a waist size on some bears so you can truly appreciate how chubby and stuffed they really are! 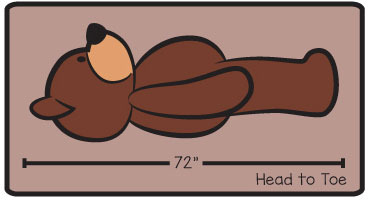 We have a Size Lineup Chart to show you what size bear you are currently viewing on the product page - this example is from a 5ft (60in) bear's page. Sometimes it is easier to appreciate our beautiful fur color choices when you see them next to a human! We have 17 colors and counting...what's your favorite? Our Elephant Herd (NEW November 2017) - we show some of our families together so you can see the size comparisons of each. *We're in the process of updating EVERY product page on our website to include the sizing chart information, so 'bear' with us if you land on one we haven't gotten to yet! Some companies add super long, skinny legs to fairly normal bear bodies to claim bigger sizes. NOT Giant Teddy brand. We make our bears proportional, so the head, body, arms and legs ALL get bigger and chubbier as the sizes go up. We never want one of our stuffed friends to lose their cuteness or Cuddle Factor just to claim they are 'big' because size only matters when quality does, too. We're adding more and more videos to our website, YouTube Channel, and social platforms so you can see how the bears look in more of a real life way, next to objects you recognize and humans. 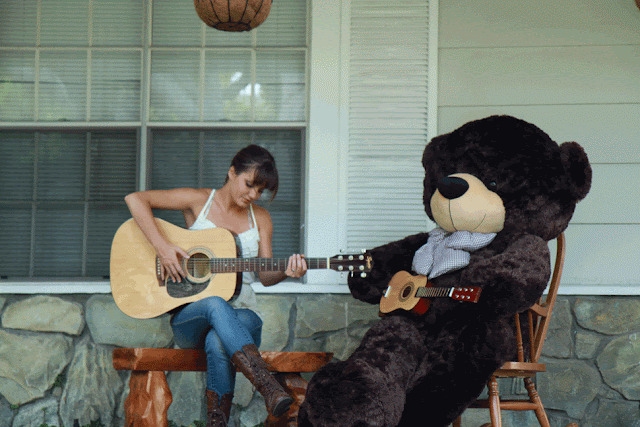 6ft Brownie Cuddles makes his musical debut! Finally, we stand behind EVERY product we make. This is more than a business to us - it's our reputation and your happiness. We want both to be top notch! 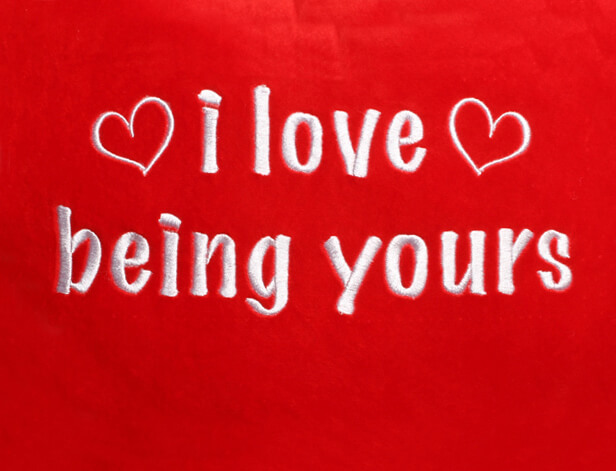 There's nothing quite like a personalized Valentine's Day gift to show your sweetheart how special they are! At Giant Teddy, we've got some really... GIANT ways to send a message of love. 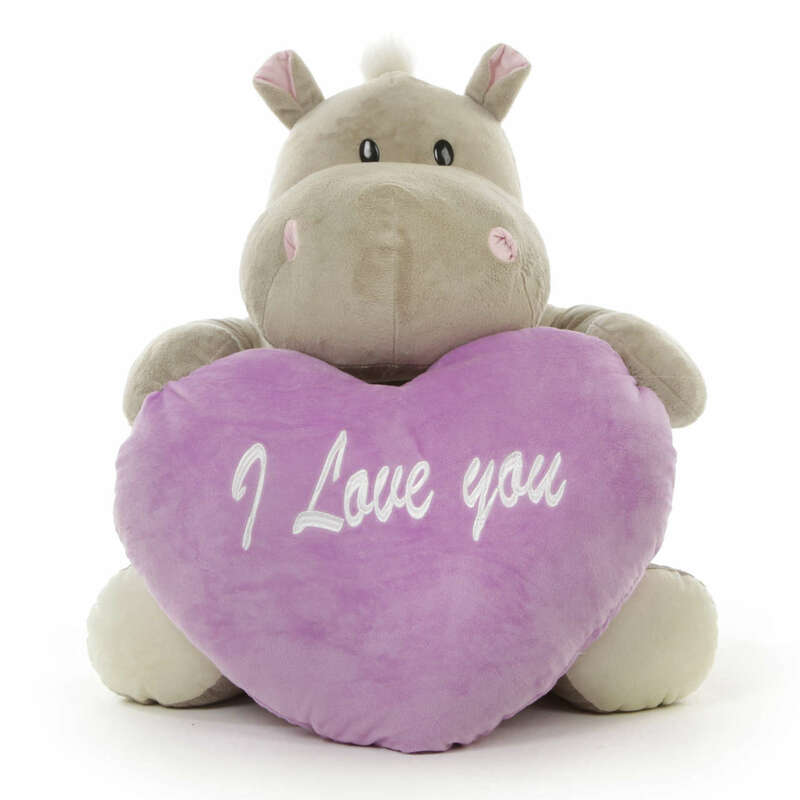 We've put some of our favorites in this Personalized Valentine's Day Gift Guide, and you can find them all and more in our special Valentine's Day Shop on GiantTeddy.com. 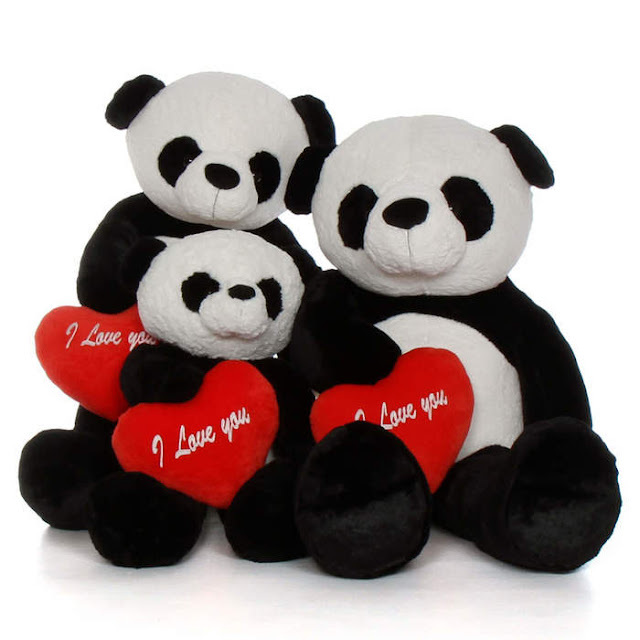 These adorable teddy bears are perfect messengers of love for someone special. Available in lots of color and size choices, your gift will be one-of-a-kind and remembered forever. *Shirts are removable and hand washable. Adorable Diamond Shags silver grey teddy bear is personalized with your 3-5 word message AND includes a big "I love you" message heart! Just say "Awww!" now! Huge true red teddy Bear Bitsy Cuddles in a unique heart shirt design with 3-5 words of personalization space. Your Valentine will love one! Smooches are sure to follow when your sweetheart gets this huge 6ft Valentine's Day Teddy Bear in a "Kiss Me" shirt design, with 3-5 words from you printed underneath. When you want a personalized teddy bear but might need it to be more platonic, how about our gold paw print shirt design with space for 3-5 words? Shown here with 4ft Bitsy Cuddles red teddy bear. Cha Cha Big Love is hot pink and ready to take your personalized message to someone special! Personalized Bears in SO many designs, sizes & styles! One of our all time best selling personalized Valentine's Day teddy bears! 6ft Coco Cuddles white bear in a big red heart shirt with 3-5 words from you. Available in lots of other colors, too, and sizes 4ft, 5ft, and 6ft. We're all about choices at GiantTeddy.com which is why we have SO many colors (17+) sizes & styles to choose from, like purple DeeDee Cuddles shown here in our 6ft (72in) size. 48in (4ft) Brownie Cuddles is SO sweet! Shown here in a small red heart shirt design with space for your personal message underneath. Brownie is available in more sizes, with and without personalized shirts. Our Favorite "Semi Personalized" Valentine's Day Teddy Bears! 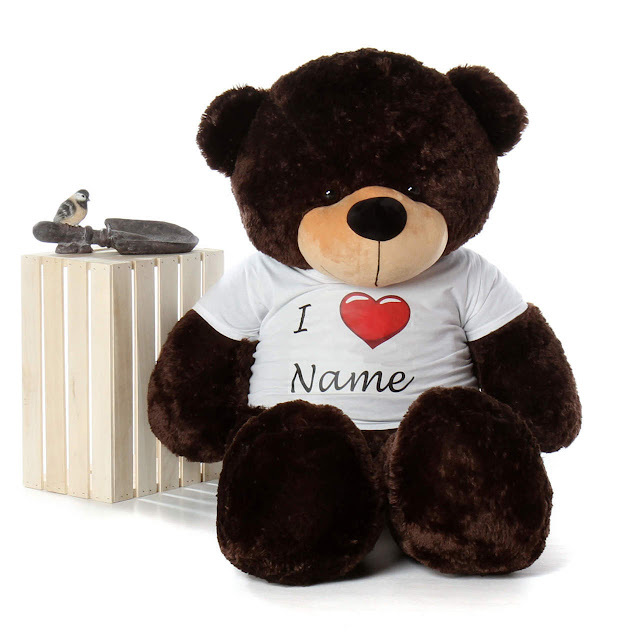 We offer some ADORABLE bears in semi-personalized shirts, where you are choosing from phrases to have printed, or adding a single name. 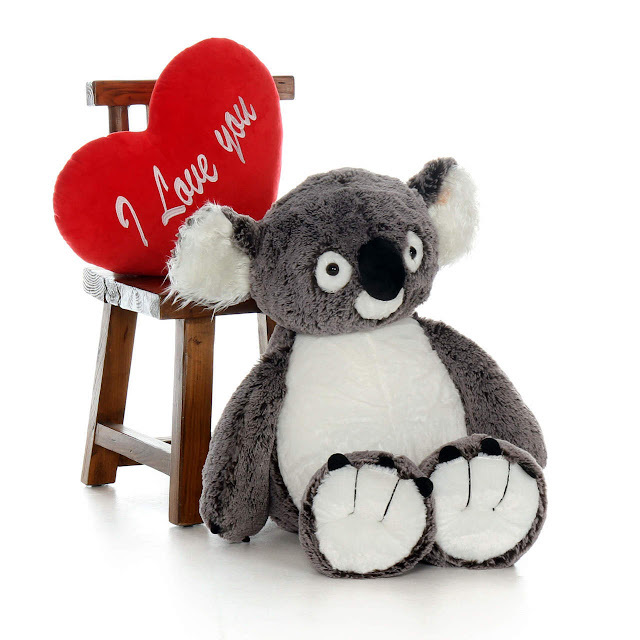 Find them all in our Valentine's Day Shop and Personalized Teddy Bears. 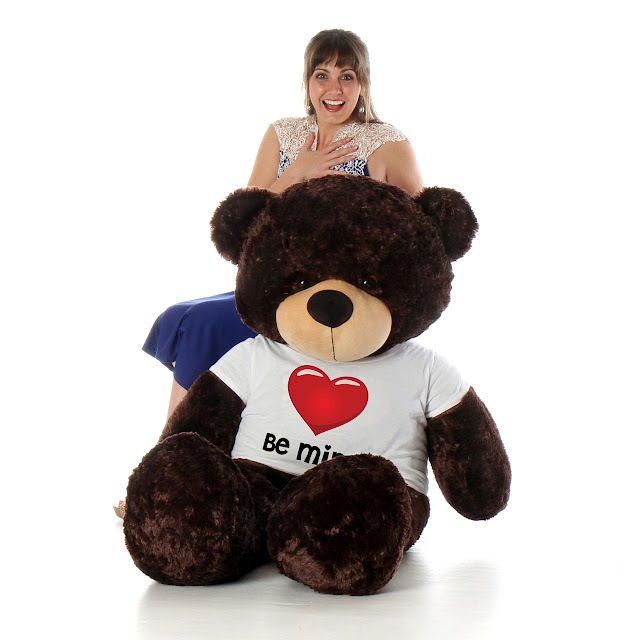 Brownie Cuddles is shown here in our 60in (5ft) size wearing an, "I <3 Name" shirt - you tell us what name to print! Available in other sizes and bear fur colors. Close-up of our "HappyValentine's Day" triple heart shirt. Choose from one of our many names/endearments/phrases to have printed in the "your choice here" section, and also choose your bear fur color - 7 choices! Coco Cuddles (white) and Sunny Cuddles (mocha) shown wearing our "Your Choice" Triple Heart shirt design. 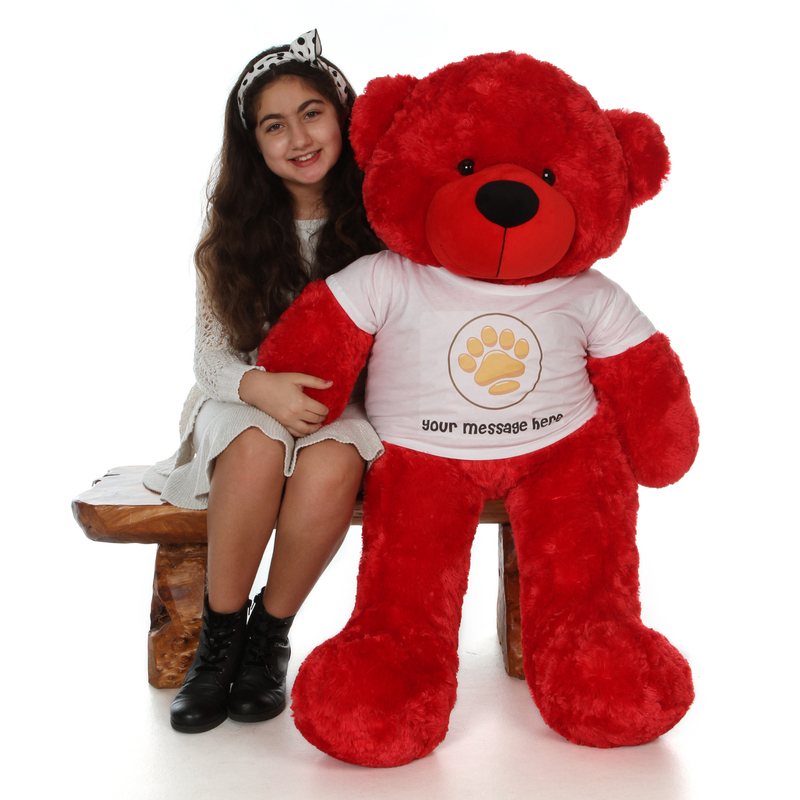 Choose from a 4ft or 5ft teddy bear and 7 fur colors, as well as choose from our message choices. 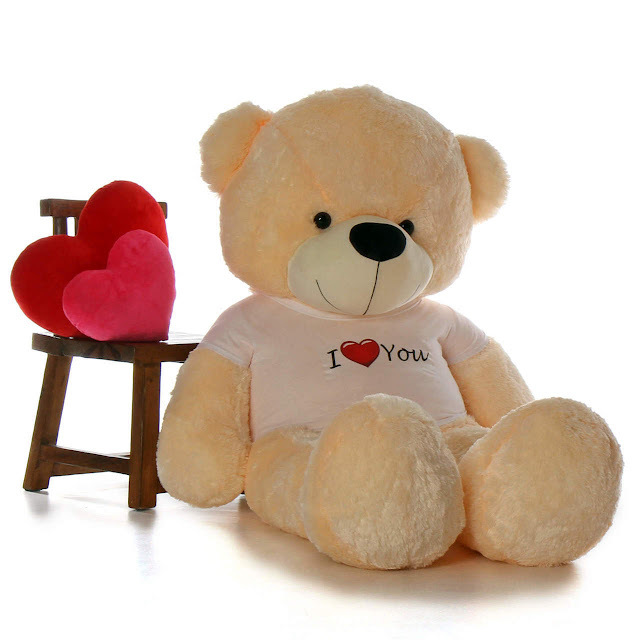 Available in 7 Fur Color Choices - 6 Foot Teddy Bears for Valentine's Day! We've taken the pressure off you with these adorable choices! Perfect for your Valentine. Will you be my Valentine? Classic and sweet! 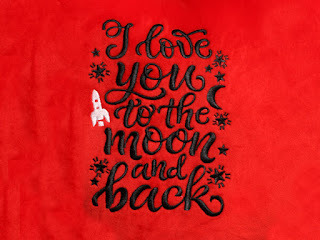 Available on many sizes & fur colors in our Valentine's Day shop. Be Mine. Always a hit on Valentine's Day - shown here on Brownie Cuddles, and below on Coco Cuddles (white) but available on other colors and sizes, too. Classic "Happy Valentine's Day" with a cute little cupid. Get right to the point with this "Let's Kiss" lip print design! Shown here on 6ft pink Lady Cuddles. I <3 You... how can you go wrong? Shown here on 6ft Cozy Cuddles vanilla cream Giant Teddy bear. 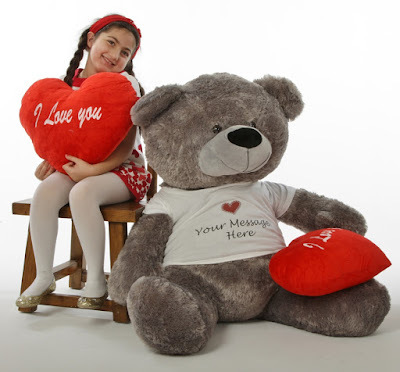 Personalize ANY Giant Teddy bear - add a shirt, or a message heart set, or both! We really are all about choices...add one of the shirts from our T-Shirt Gallery to any bear on our website (sized specifically for teddy bears, may not be available for other animal friends we sell) to make your own personalized gift. Create Your Own... choose a design from our t-shirt gallery and add it to any teddy bear on our website for the perfect one-of-a-kind gift! We also have some fun Message Heart Pillows to choose from! Come see all the choices we have. Huge Red Heart Body Pillow and 2ft "I love you" shirt white teddy bear gift set. Valentine's Day... almost every girl's heart beats a little faster at the thought of February 14th! 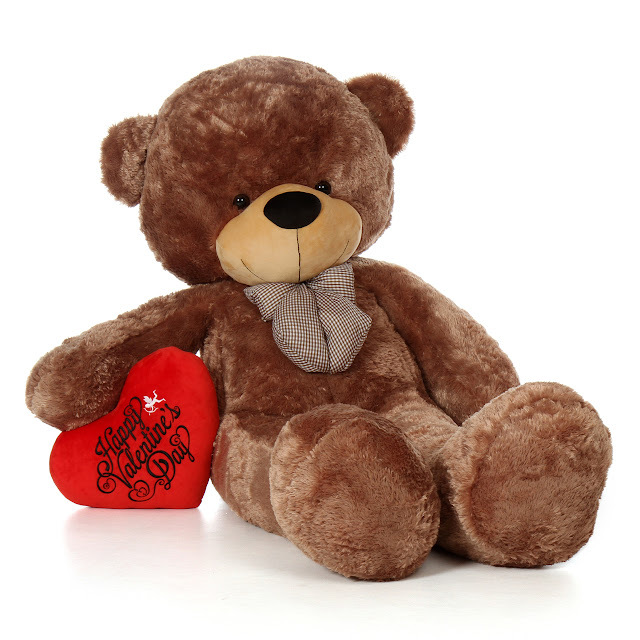 If you have a special lady - of any age - in your life, we've got some amazing & cuddly gift ideas on our website, GiantTeddy.com, that are sure to steal her heart. Flowers & candy? Those are nice... but they don't last. Your love is forever, so shouldn't your gift be, too? 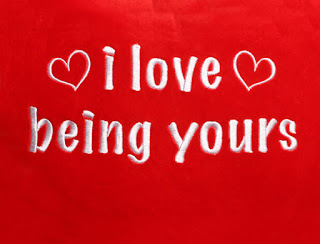 And if you don't have a special person to give you something, be your own Valentine! 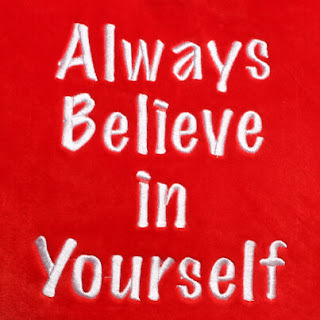 You're special all on your own. You can always send an UN-Valentine if you or your friends are taking a pass on love this year... a big cuddly teddy bear will never let you down! Make sure your gift arrives on time! 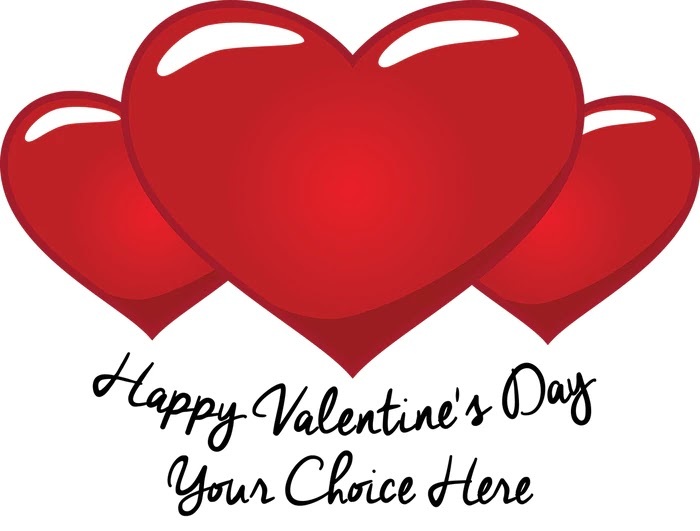 We'll post Valentine's Day schedules on our Shipping Page so you don't miss order deadlines for the big day. Here are some of our favorite categories for Valentine's Day gifts. If you need help finding items on our website, use our handy "Search" feature, or Contact Us for assistance. A personalized gift on Valentine's Day shows a lot of thought and love. These are perfect for a friend, family member, or the one who holds your heart. Available in lots of styles, colors, and sizes 2ft (24in) up to 6ft (72in) we know you'll find the perfect one. Here are some of our staff favorites for inspiration, and find even more choices in our Valentine's Day Personalized Gifts section. Brownie Cuddles in a personalized shirt - up to 5 words! 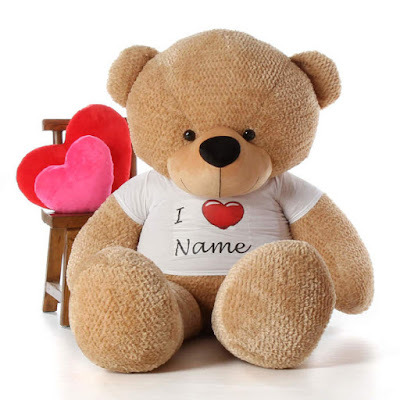 Always a winner - add your sweetheart's first name to this adorable personalized Valentine's Day Teddy Bear! Available in lots of sizes up to 6 feet, and over 10 super soft fur colors. 3-5 words of personalization on this sweet design. 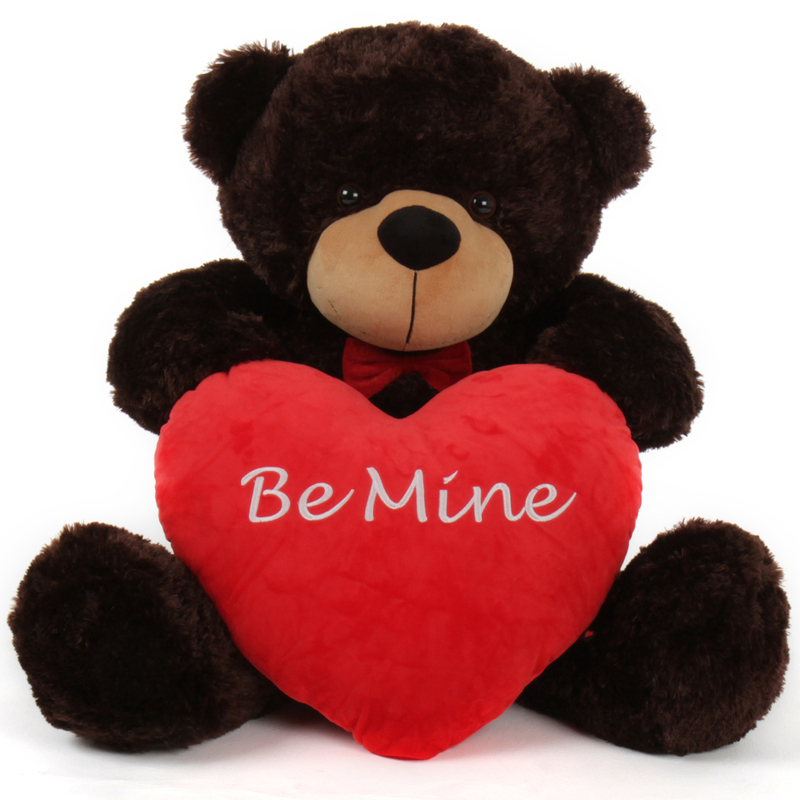 Create your own Personalized Valentine's Day Teddy Bear! Add this "Be Mine" shirt, with 3-5 words of personalization, to any bear on GiantTeddy.com for a unique, one-of-a-kind gift. Cha Cha Big Love is hot pink, with hearts on her foot and a personalized heart shirt - perfect for your Valentine! How cute! Personalized boxer shorts (removable) are sized especially for our life size teddy bears. Choice of fur colors. Valentine's Day is all about love, and we've got some big cuddly bears and animals who arrive with a plush heart in tow - or you can even get the hearts as gifts by themselves! They make fun decorating conversation pieces in offices, dorm rooms, bedrooms or anywhere. Take a peek at some of our favorites, but you can find even more choices in the Valentine's Day shopping section of our website. What?! Yes, a huge heart body pillow! 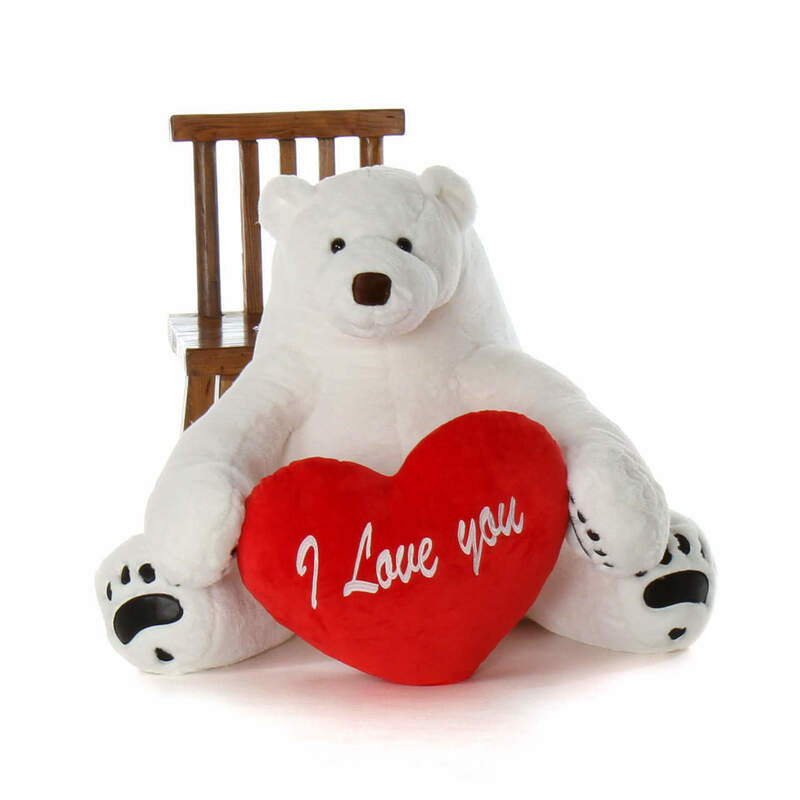 We have a fun gift set with this pillow and a cuddly bear with a huggable pillow style body. (Or choose 1 of 2 sizes of heart body pillows without a bear.) 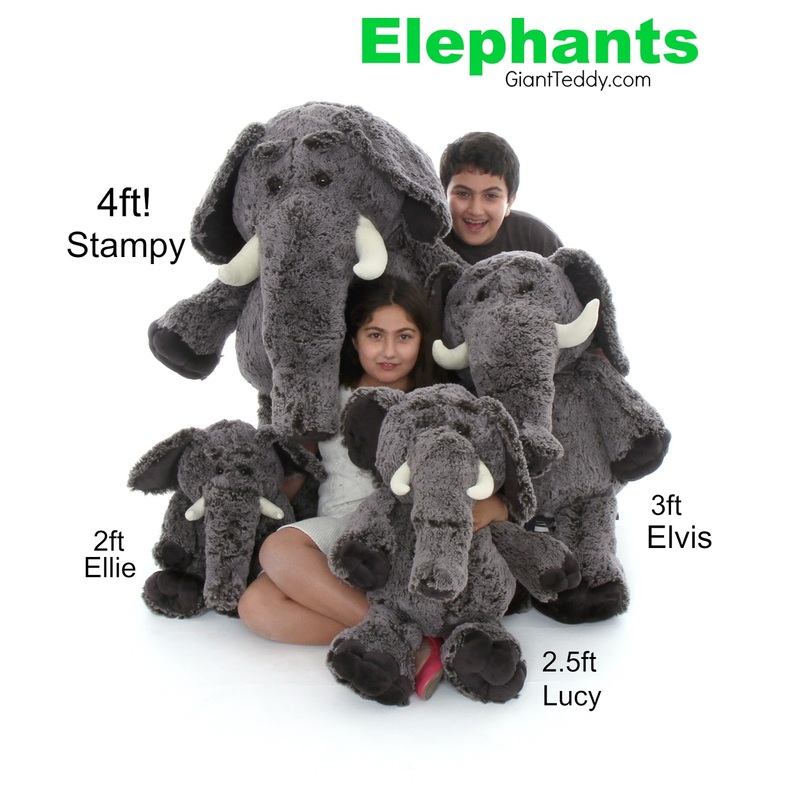 So many fun gifts on GiantTeddy.com! If you have to be apart... for 10 minutes, 10 hours, 10 days, 10 weeks... we know it is hard to love from afar, so we paired this "I Miss You So Much" heart pillow with our biggest & most popular bear, Sunny Cuddles in the 72in/6ft size. For Polar Bear fans, a big "I Love You" heart makes the perfect combination for a cuddly cute Valentine. This cute plush heart says, "Happy Valentine's Day" in beautiful black embroidery with an adorable little cupid in white. Shown here with our 6ft Sunny Cuddles teddy bear, this heart is available with other bears, too. 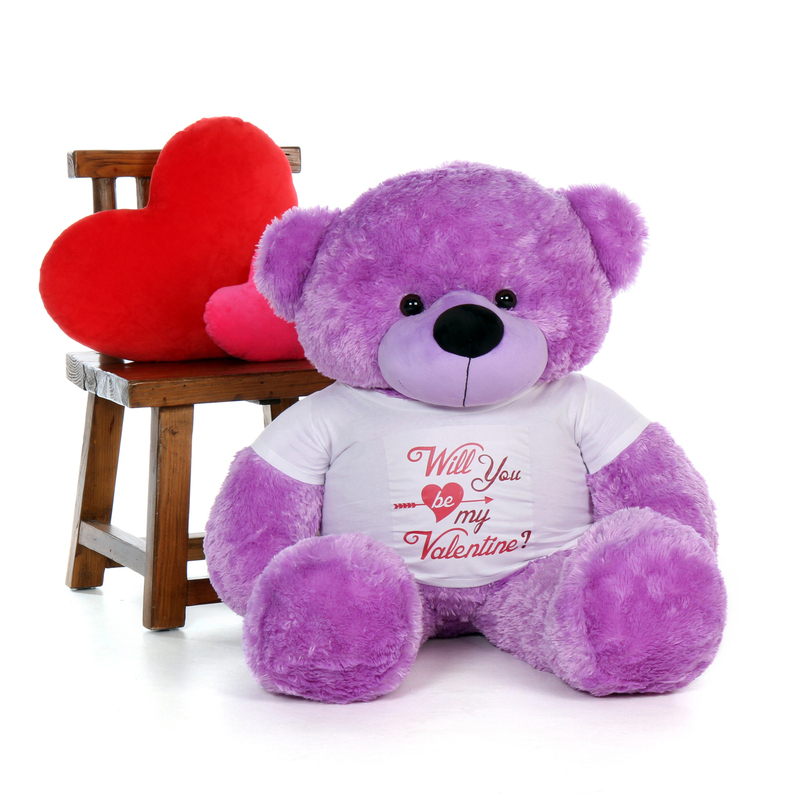 For the girly girl of any age, a purple teddy bear and a giant pink heart with "I Love you THIS much" on it make a great Valentine's Day gift. Classic Red & White for Valentine's Day! A huge, fluffy white teddy bear holding an equally huge "I love you THIS much!" red heart pillow. Perfect! A BEARY winning combination! 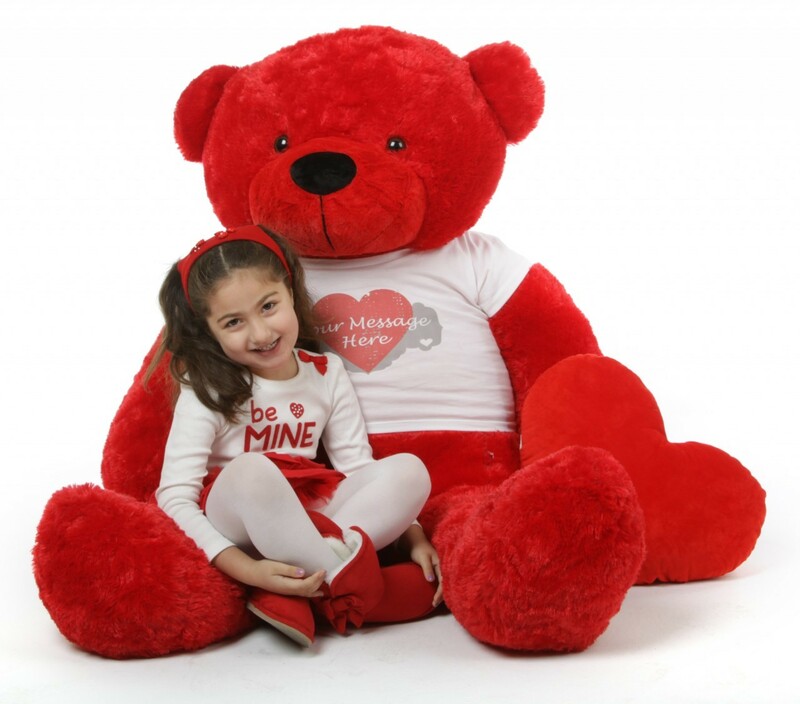 A personalized Giant Teddy bear for Valentine's Day holding an "I love you" plush red heart. Win-Win! 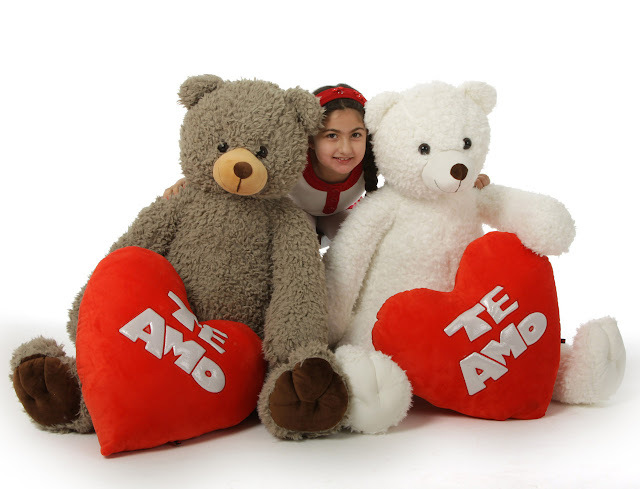 Giant Teddy bears are adorable in any language - send one of our cuddly Te Amo bears to say "I love you" in Spanish for Valentine's Day. Sometimes you need a gift for someone special that doesn't say the usual "I love you" for Valentine's Day. We've got you covered. 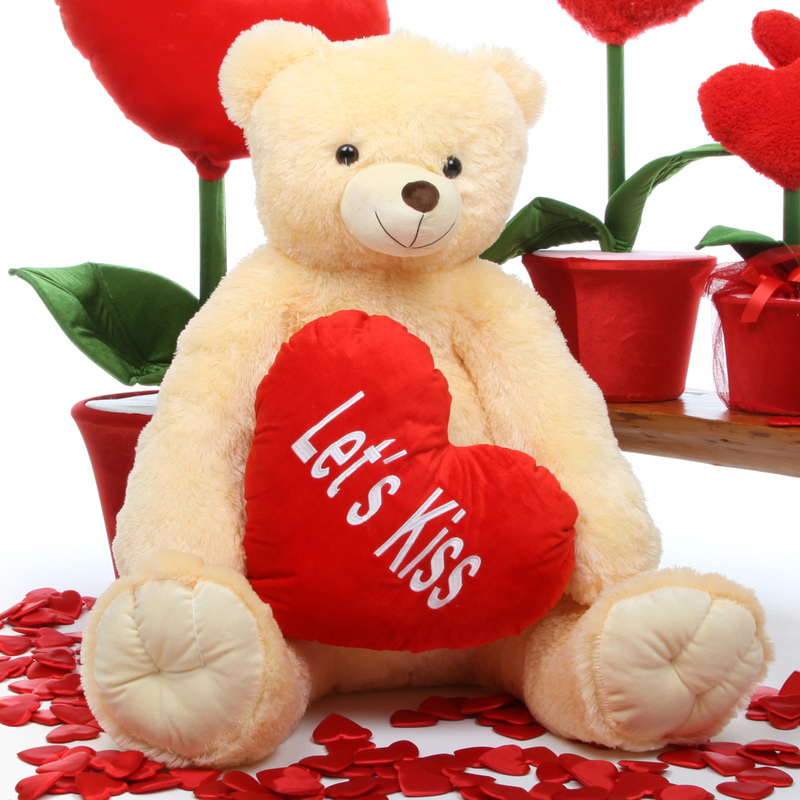 This cute teddy bear is big in size & your Valentine will get the message! "Let's Kiss" pillow for romance at any level of relationship status. Perfect. Be Mine is a classic Valentine sentiment to send someone special! Brownie Cuddles makes the perfect delivery bear to hold it, too, with his cute red bow tie he's ready for the big day. 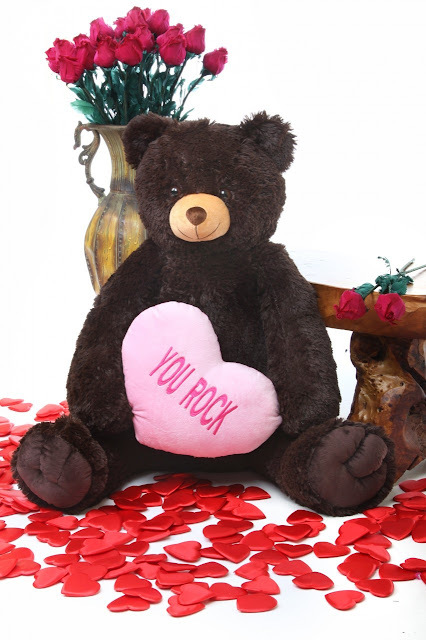 This cute bear is Juju Cuddles - super soft black fur, plush brown nose, and a blue heart with "Big Hug" embroidered on the front make this gift ideal for a Valentine of love or friendship. Let's Kiss pillow in yellow - unique, just like your Valentine! 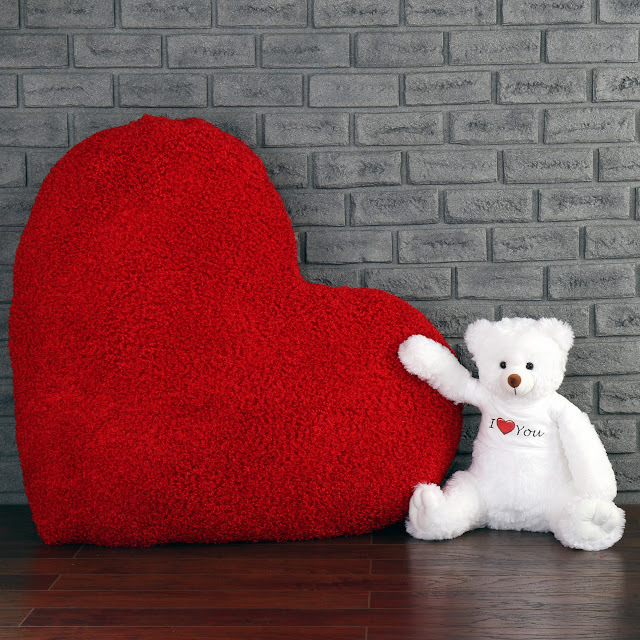 We're more than just adorable life size teddy bears - check out some of our other sweet, oversized stuffed animals perfect for your Valentine! 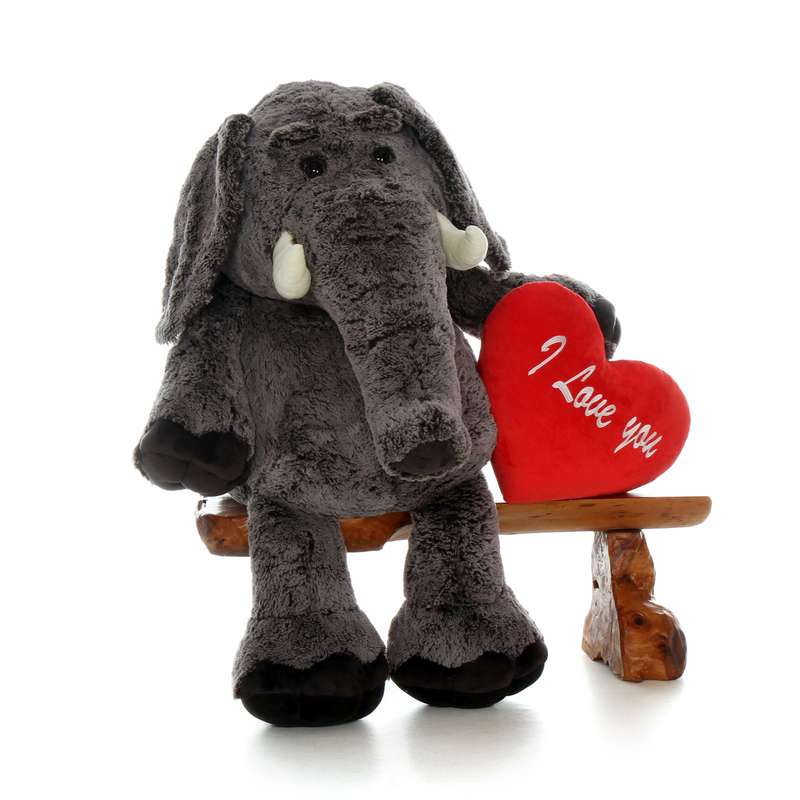 Stampy our 4ft Elephant with a red "I love you" heart for your Valentine! 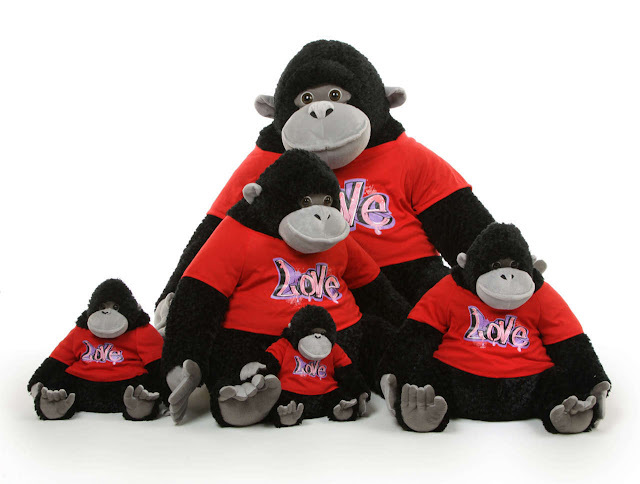 How about one of our cute gorillas in a Love shirt? Hip-Hippo-Hooray! A sweet stuffed hippo holding a lavender "I love you" plush heart might be perfect for your Valentine. We don't monkey around when it comes to adorable. Oh wait, yes we do! 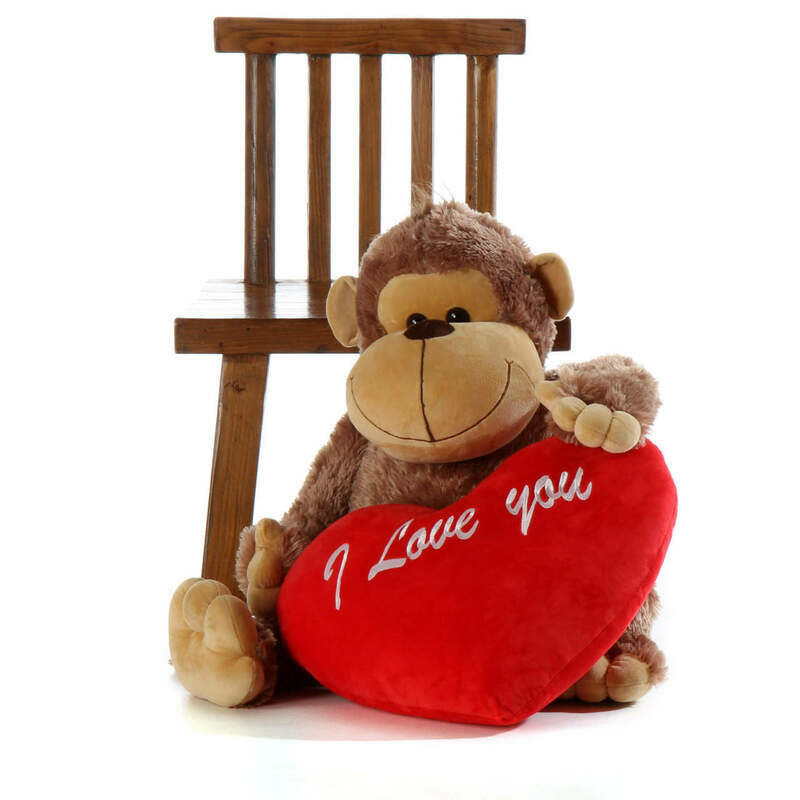 This sweet 3ft monkey is Silly Sammy & he comes with this red "I love you" heart for Valentine's Day. Koalas aren't actually bears, but they sure are cute! 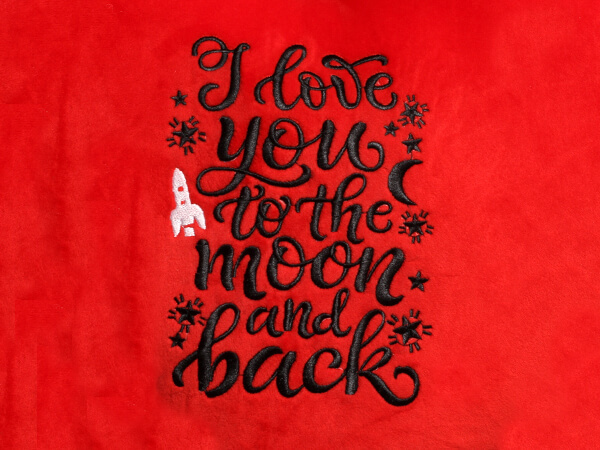 And for Valentine's Day, we've included this red "I love you" heart for the perfect gift set. 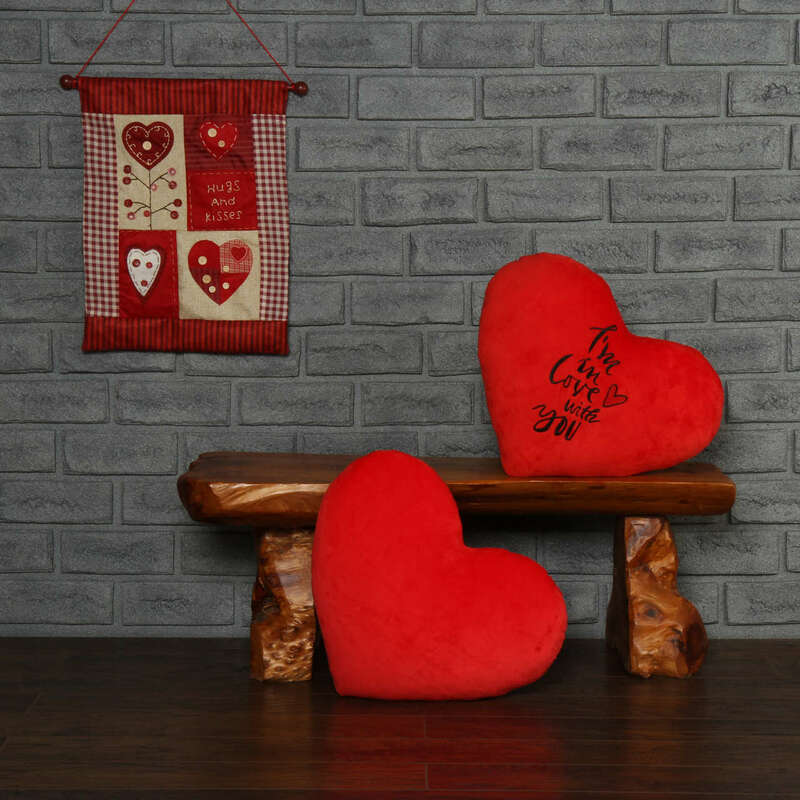 We love the idea of love, so we are creating a line of giant stuffed hearts and Heart Pillow Pairs that make great gifts anytime but on Valentine's Day they'll be sure winners! Our new Pillow Pairs are awesome! 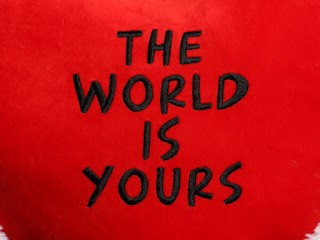 You get 2 pillows, with different messages embroidered on the front, or 1 message pillow and 1 solid pillow. 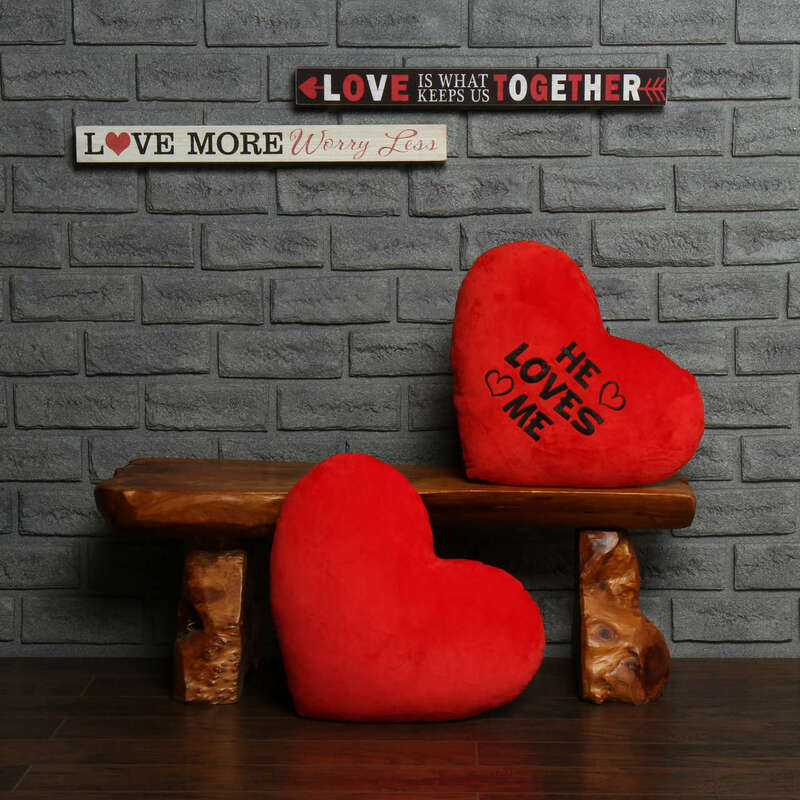 This set includes a "He Loves Me" pillow and a solid red pillow. Another look at Pillow Pairs! This is how the pillow size in our Pillow Pairs looks next to a life size bear and a person. This giant heart body pillow is available in 2 huge sizes! A note about quality: Giant Teddy is made in the USA. 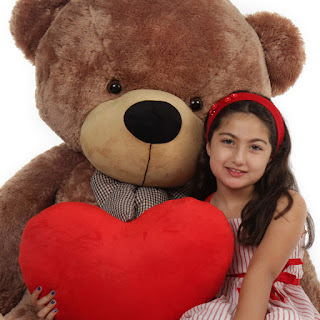 We are located in sunny Anaheim, California, and we stuff every teddy bear, animal friend, and heart with love. You won't find our brand in stores, and we don't try to compete with big box discount retailers who offer a few large stuffed animals. 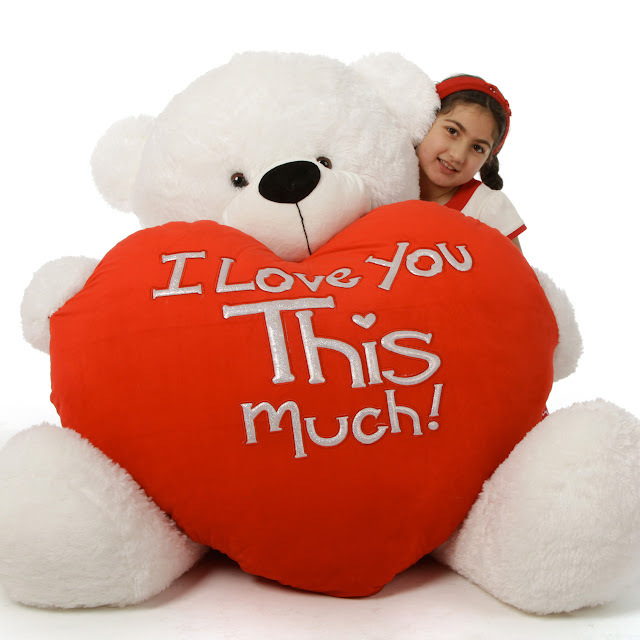 We have more sizes, more colors, more styles, personalization, uniqueness, and the most chubby, cuddly, super soft adorable teddy bears anywhere on earth. We think the people you love are worth it, and we stand behind everything with our Paw of Honor Guarantee.